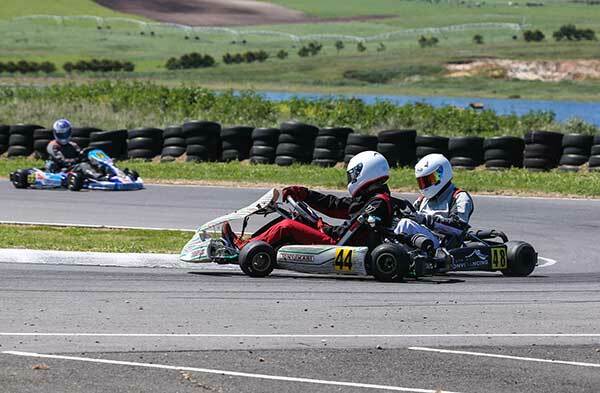 327 karters have competed in at least one VCS round in 2017, and it was all to play for at the final round with 1604 points up for grabs. Further photos on Pace Images’ Facebook – Saturday pics HERE, Sunday pics HERE. 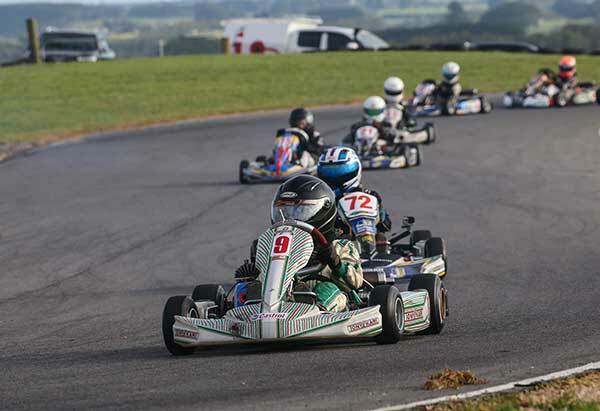 The final round took place at the Buckleys Road facility where some 160+ karters set up for 2 days of action packed racing. 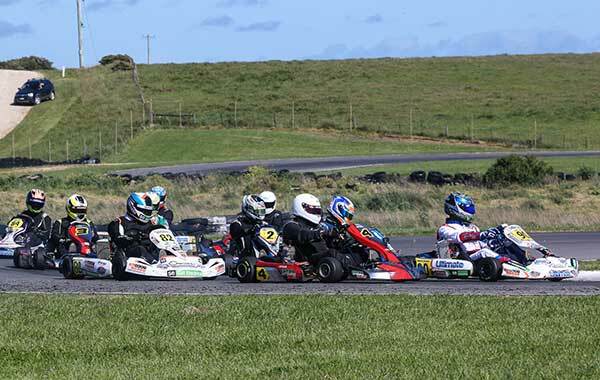 Warrnambool’s club president Murray Swayn was walking very tall and proud of the well prepared facility that would host the final round of the biggest country series in Australian Go Kart Racing. 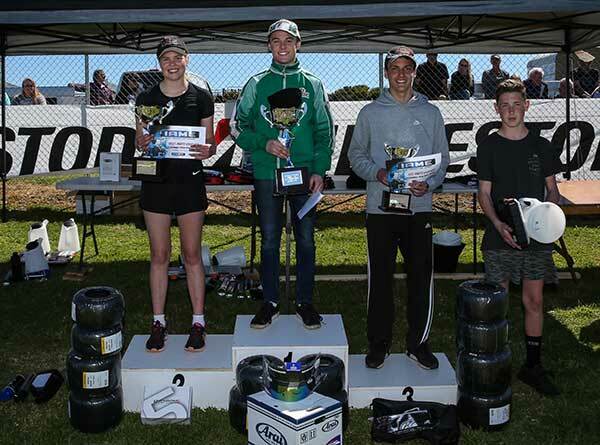 The weatherman decided to leave the best for last, and although a slightly chilly wind was sweeping across the track on Saturday, Sunday was absolutely perfect with spring sunshine and even Warrnambool’s infamous coastal winds behaving angelically. 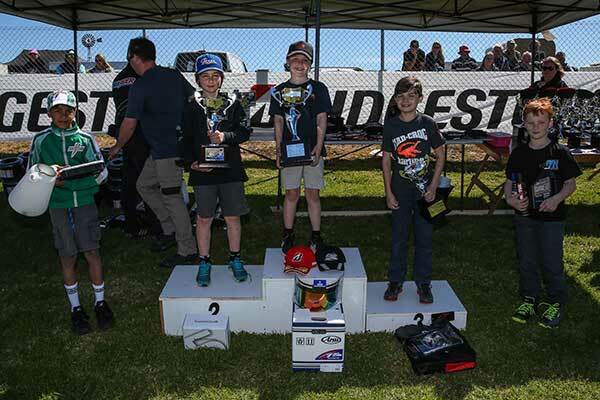 At the final round the #7 Gerry Westerveld was back on top,taking a clean sweep of the meeting unlike the penultimate round where he missed the podium. 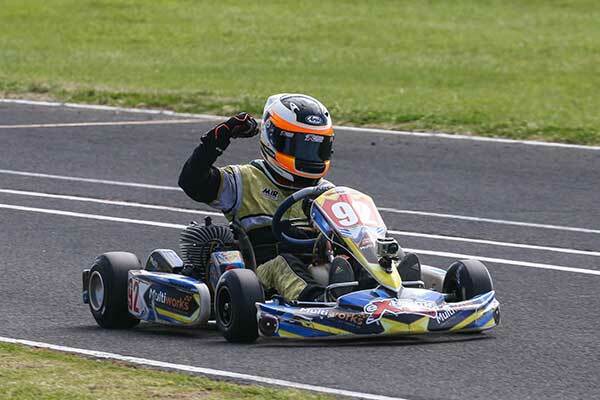 #33 Alexander Barallon was the only one to take the race up to the #7, however the racing for the minor placings was some of the best racing of the weekend, and of the 6 rounds. #98 Andrew Sotiropoulus wasn’t far from the action in the opening heat coming home in 3rd. Heat 2 was a repeat of the first, except the #88 Andrew Mrhar claimed 3rd in the next 2 heats. The #88 Anthony Mrhar ,#98 Andrew Sotiropoulos ,#4 Lachlan Hill and #48 Jonathan McKean put on an awesome display of restricted racing with lots of passing throughout the 18 laps. 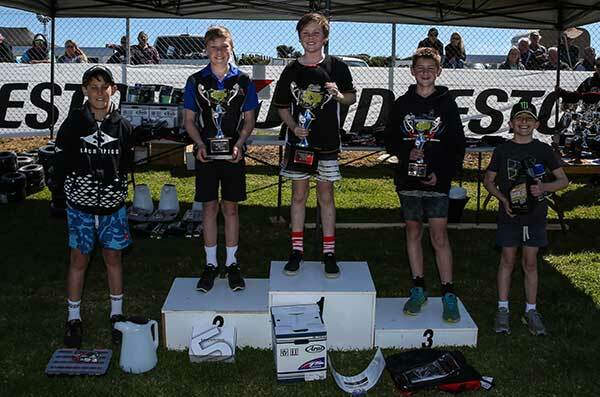 With the #7 of Westerveld out front and #33 Alex in clean air, the #94 of Joeseph Clough would come back (after losing a chain in an incident with Hill in heat 2) to seize an opportunity and go on to take 3rd in the final. 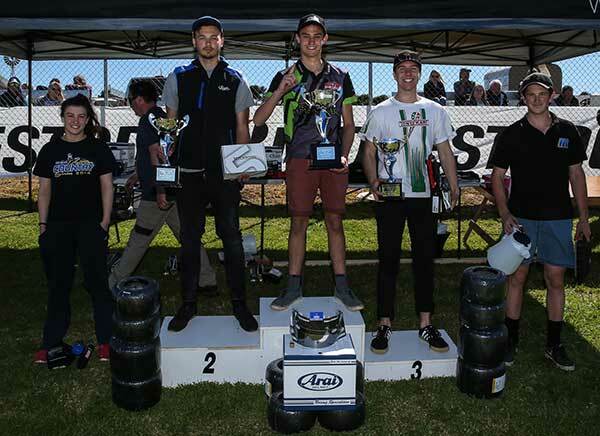 The Geelong star #90 Daniel Richert came to Warrnambool with a mission and went about his racing in fine style, claiming pole, all the heats and the final convincingly. 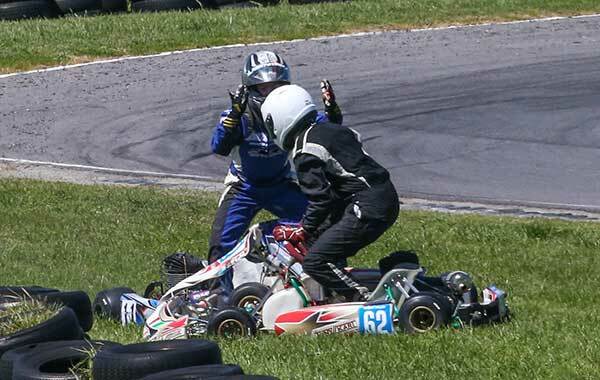 The #3 and #4 of Adam and Scott King could only watch as the #90 Daniel Richert showed how it was done. #2 Aaron Jackson was unusually off the pace (Possibly still suffering mechanical gremlins after a sieze in qualifying), but the man to watch in the pursuing pack was #54 Aaron Hindle. 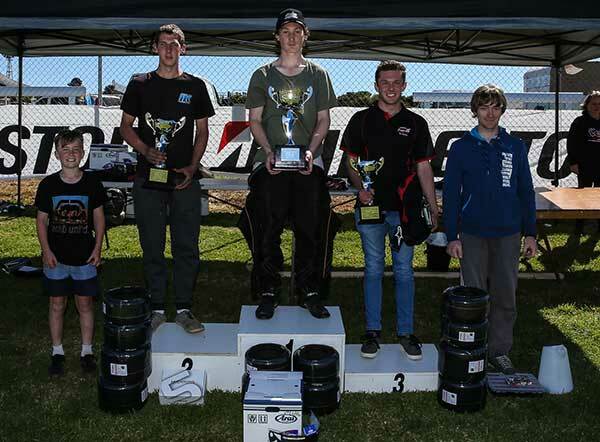 Once Hindle was able to clear the King line up and was in clear air, the final was his chance to get on the top step. 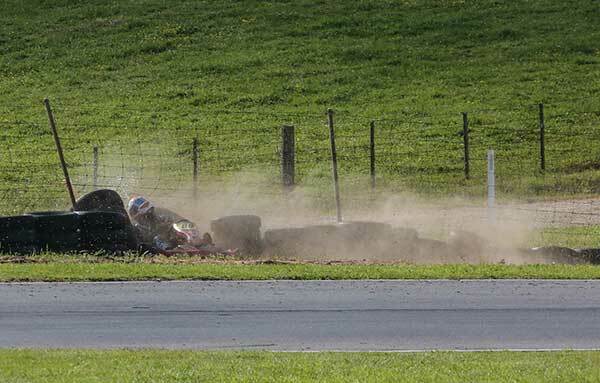 He almost made this happen however a small mistake saw him leave a gap for Richert to go on and take the win. #71 of Paul Feely was becoming more familiar with his new package, however a slight mistake saw the #71 visit the grass twice in the heats, but regained some pride by finishing the final in 7th in front of Jackson. 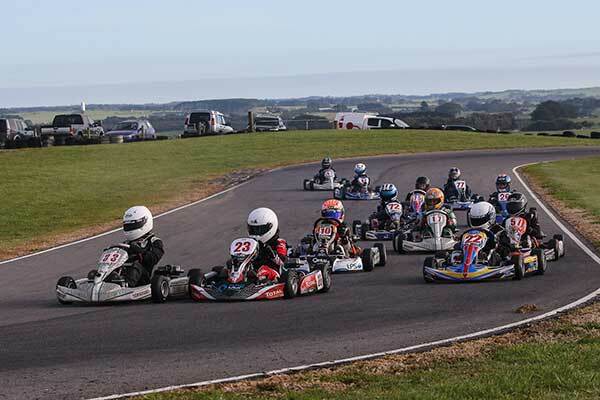 You could have thought the opening heat on Saturday was the start of the season final on Sunday as turn 1 was all action. The #42 of Will Kelly Merryfield launched up up and around and over the top of an innocent #12 Ryan Morgan ending up on the grass after turn one. This would be a most spectacular incident played out over 40 metres. #65 O`Leary and #95 of Williams were the standouts throughout the heats. The 6th round would see #62 Miller having one of those weekends to forget but finishing the final in 4th to regain respect and valuable points. #13 Ryan Bettess, #73 Kai Upiter, #90 Ethan Church and several others were dicing hard for the minor places throughout the heats and final. This made for exciting viewing from the crowd gathered at the fence looking on. 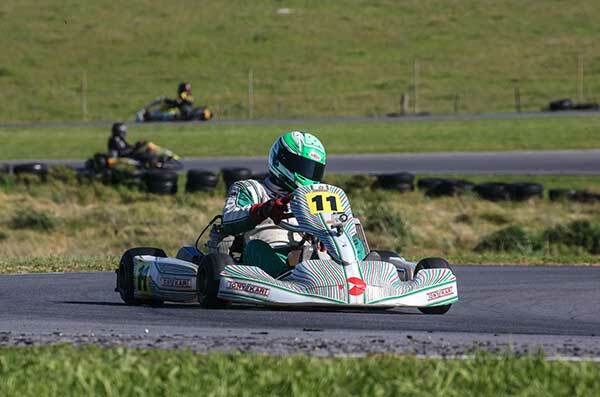 In the end O`Leary was too good for Williams and went on to take the final. #88 Kirby Hillier looked like the man to beat and took pole with #82 Connor Farr and #54 Jordan Pianezzola in hot pursuit. The Lights would give us some of the best racing of the weekend with positions changing every lap. #54 JP would take the first 2 heats from Farr and Rae then #9 Rae got the best of the start in heat 3 from lights to flag. The #11 Ashley Lear wasn’t far from the action just lying in wait for an opportunity. By far the most spectacular exit from the heat 3 race was from the horseshoe at the bottom of the fast downhill section. 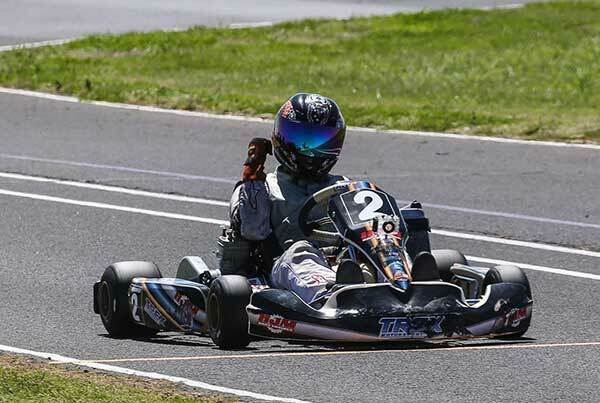 Losing a brake pad saw the #88 go full noise into the tyre wall (Todd Hazelwood style), hitting it very hard but able to get out of the kart unscathed, albeit a little short of breath. The finish was a drag race until the end with the excitement going to the line. Jordan Rae would take the finish line first in the final, but would be denied the victory due to a formation infringement. This would also have a massive impact on the series top 2 positions. Cadet 9s were out in force to provide some awesome entertainment. The #21 Rusty The Rocket Ponting took pole, and the day, with a dominant display. 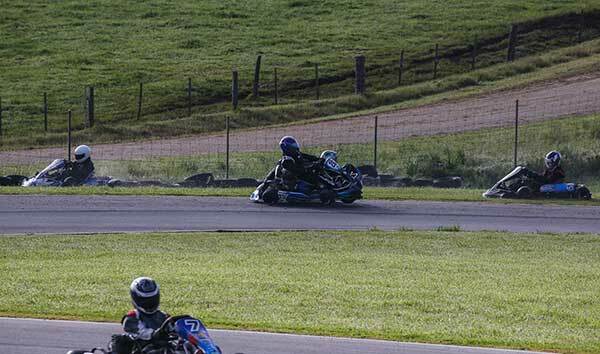 In the heats the #85 of Tyce Hodge and #94 Cadel Ambrose raced hard to sort out the minor placings. #89 Anthony Alessi showed fight and pace mixing it with the leaders but finished down the order after an incident. #3 Leo Iannella had early pace, but would end up watching from the horseshoe after leaving the track following a battle with #36 Thomas Schmidt. Tom would go on to finish in 11th. The rocket would only be passed once which lasted all of one corner when he regained the lead and was never headed. This was to be a battle between #6 Brett Jenkin and #73 Michael Angwin all day as the duo raced by themselves all weekend. Angwin and Jenkin had serious pace throughout the heats, catching and matching the pace of many Restricted Masters running 25kg lighter. The absence of #38 Marc Tune at the front the minor placings for the Restricted Heavies was left to the #82 of Aldo Distefano and #6 Brett Jenkin. 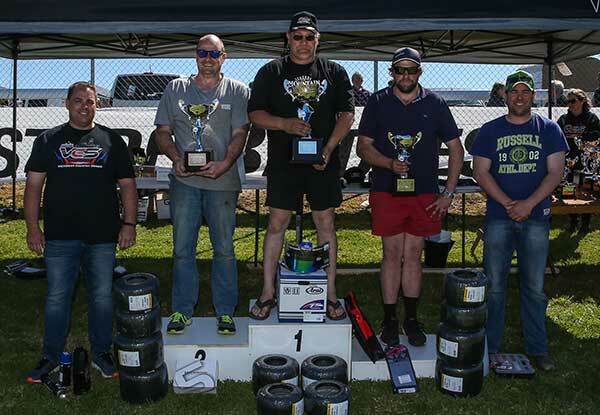 At the other end of the field, some of the Heavies were caught by the Masters but fortunately didn’t change the outcome of the heavies finishing order. Many of the masters competitors pit together and know each other well, but the nice guy attitude stops as soon as the flag drops, with no holds barred racing aplenty in the masters class. 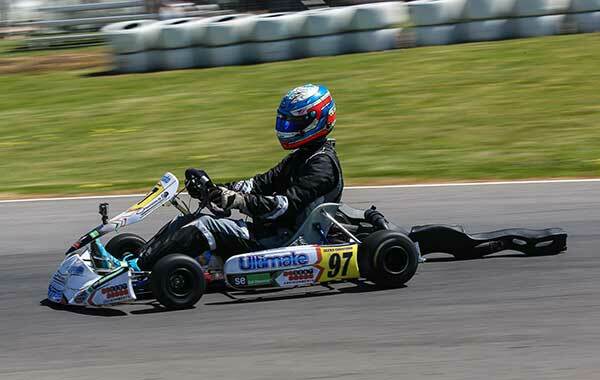 #97 Matthew Crane was the fastest this weekend proving he had the package to win it. #55 of Andrew Stubbs didn’t quite have the luck in the heats with an ever consistent #12 Steve Malkin making his way through the field. #92 Ronald Taylor showed he had cause to be at the pointy end but a loose nassau panel after a coming together would see the #92 exit the track under the meatball flag. #11 of Leon Forrest showed good pace but failed to keep it up anf fell down the order. The highlight was when #18 John Page made the most of an open door and found himself in the lead of heat3. 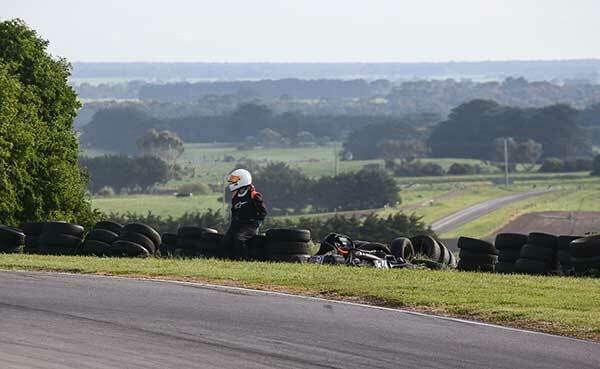 This would put him in the best position to start the final only to out-brake himself and sail through the left hander narrowly missing the field on his way through; keeping it on the island but down the field and kicking himself. In heat 3 the #97 of Crane was making his way as was the #92 of Taylor with the two coming together at the horseshoe. Crane came off worst and watched the rest of the heat from the infield. #12 Steve Malkin was the man on the move, and once at the front drove away to claim the win in the final. 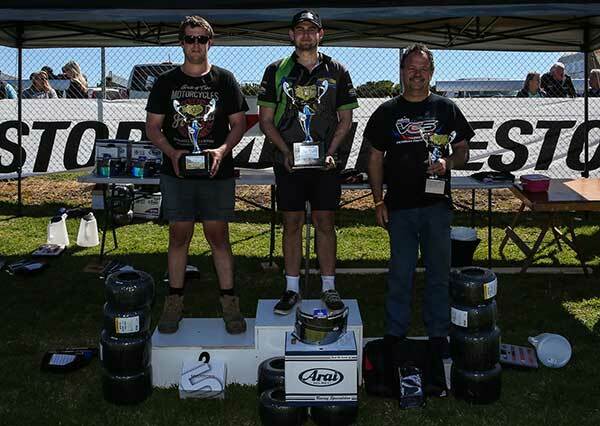 #55 Andrew Stubbs grabbed more points by getting to 2nd and Taylor taking 3rd , Crane had only the pace for 4th in the end. 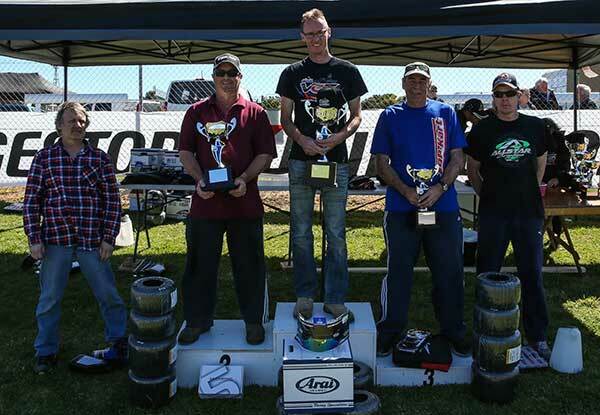 #2 Billy Westerveld was back and brought out the big broom for a clean sweep of the weekend. 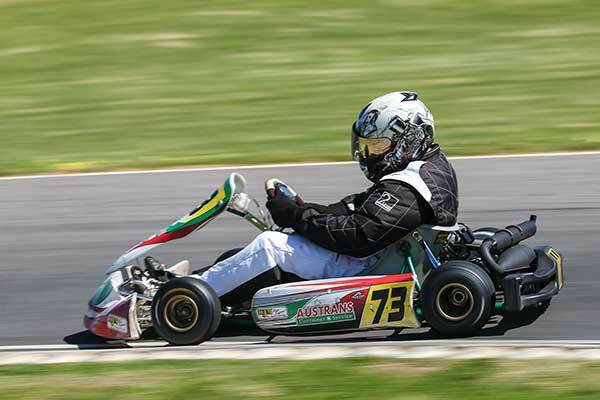 Restricted Mediums made the event a great class to watch as #57 James Stewart put his kart in contention having a great battle with #16 Phillip Zentai. 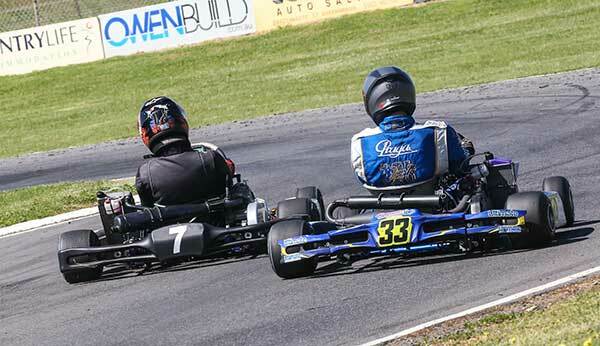 Zentai was the only one to pass the #2 at one point in heat 3 and hold on for several laps. The #69 of Phillip Reid, #3 Dumesny, #99 Clough and #43 McKay would give the crowd some highlights throughout the weekend. 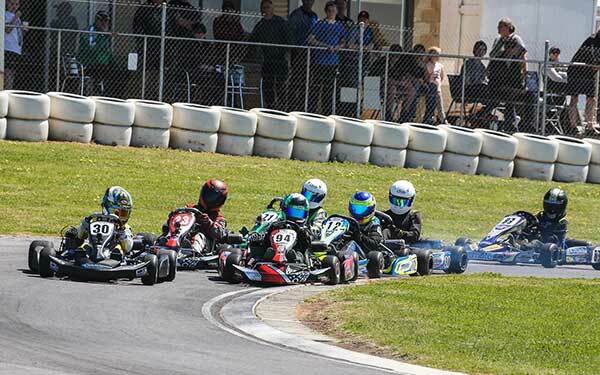 Qualifying was anybody’s guess as the karts came on. 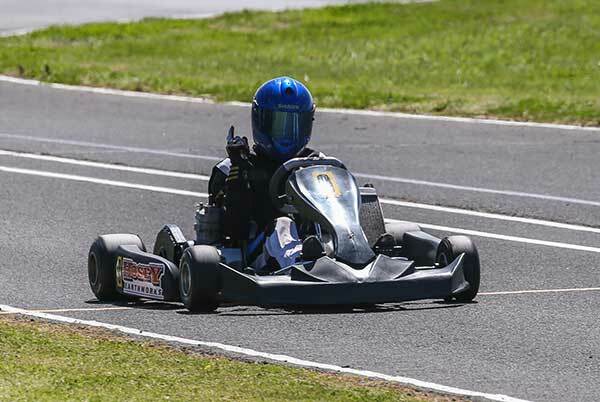 #94 Kobi Williams sealed pole, but only by a small margin. As the field of 8 covered by a tea towel the fight was on. Heat 1 and the battle was underway. 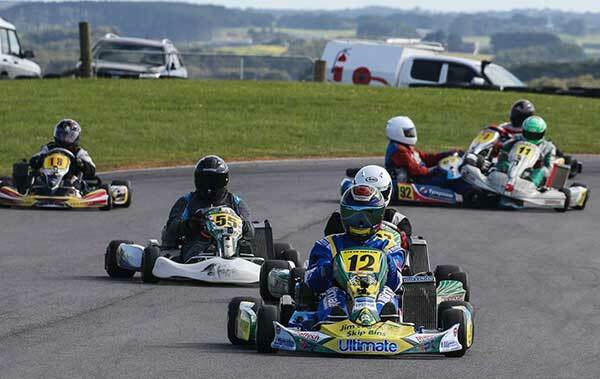 Williams made the most of being in the #1 position and let the field chase. #30 Jobe Stewart was the man that took it up to Williams but nipping at his heels were Morgan, Cox and Stephenson. #23 of Stephenson didn’t quite seem to have his usual pace but was able to keep with and make the racing hot. 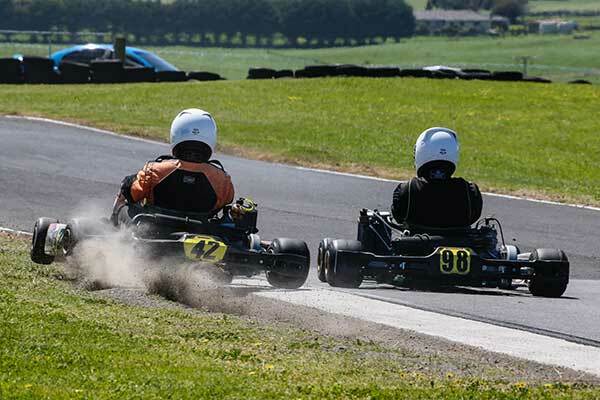 The action in a small field was electric as the KA4JL`s exchanged places, just when you thought positions were set they would change and this was the case all weekend. 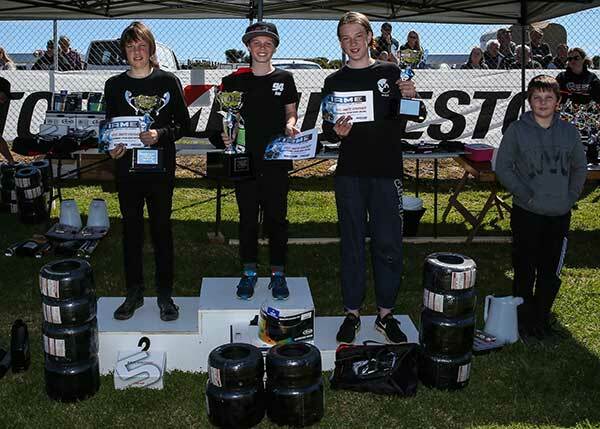 In the end Stephenson and Cox would come together handing 3rd to Morgan only to be DSQ from the final. The #6 Adam Pesek grabbed pole from a very fast #16 Bryce Fullwood (V8 Development Series) and #37 Jack Bell. Heat 1 and despite Pesek taking pole Fullwood had the speed to lead with Bell briefly taking it off him for 2 laps. Heat and the heat continued, Bell would hold on for 4 laps until Fullwood took over while Trebilcock fought hard to get past Watson. 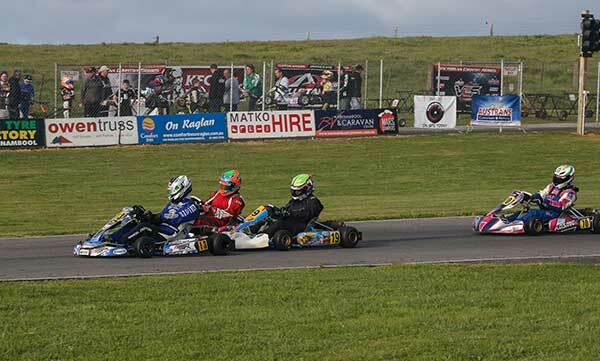 Heat 3 and Bell had issues, leaving the track early up the in-grid lane, leaving Fullwood to go on to win with ease. This elevated Watson and Trebilcock after a great fight. In the final and the opening lap would see the #16 and #37 go at it toe to toe with Bell being the victor, Trebilcock would be out on his own in 3rd while Watson and Pesek diced for 4th and 5th. 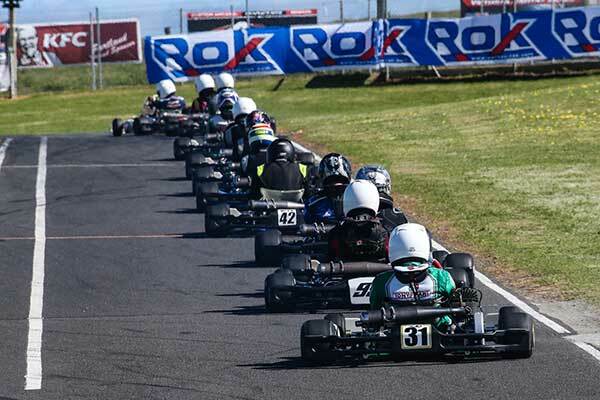 Overall one of the best races of the weekend with an extremely high calibre field. 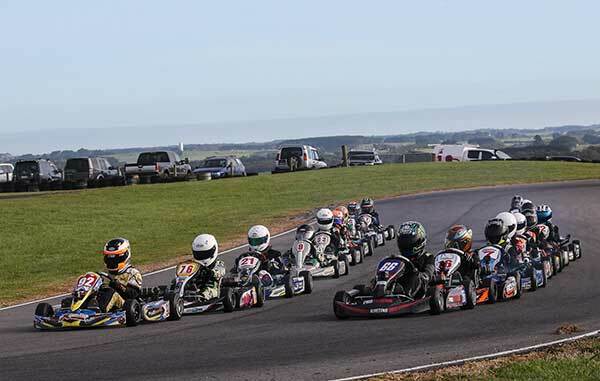 A small field of KA3 Senior Mediums was on hand to contest the final round, minus the #20 of Remo Luciani. 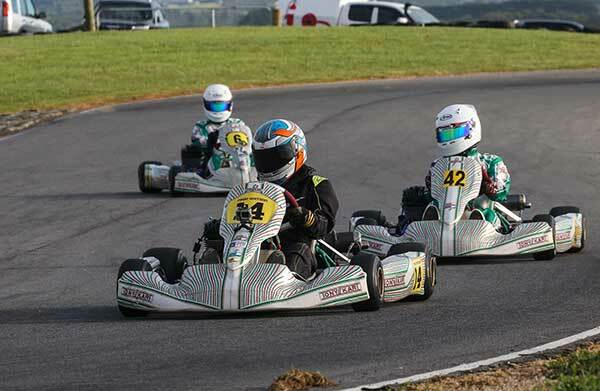 Remo left the field to fight it out for the minor placings after winning every previous round, and was required overseas at the X30 Internationals in Le Mans. #13 Jackson would take pole and positions would rarely change after the start of each heat and final. Thomas and Jackson would trade places throughout the day, however it would be Thomas that would take the chocolates. #19 Baker and #70 of Mason would trade places for the minor points with Baker taking 3rd. This was without a doubt the best class of racing in round 6. #66 Will Harper was in the mood to continue on his way at the front, but the return of #16 Jesse Lacey, combined with the #92 of the Dominator #92 Matthew Domaschenz, made for the hottest action on the island. The #92 would take the first heat out of the 3 drivers, #66 Harper knew he had to get a good start and that he did taking it all the way to flag in heat 2. 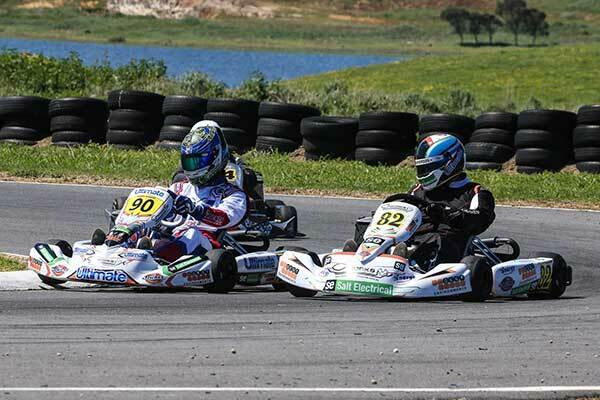 Heat 3 and the pressure was immense with all 3 leading at one point of the race. 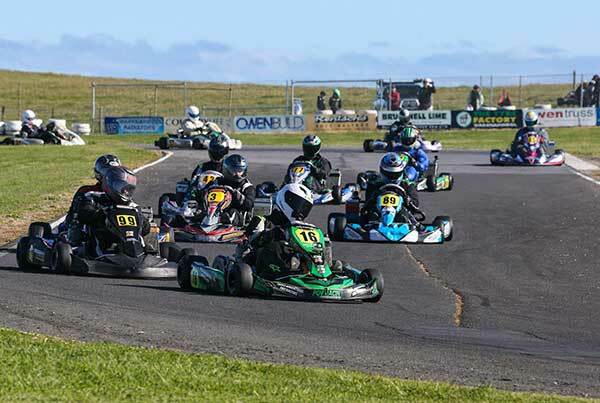 While this was going on at the front the minor placing was a battle in itself between #33 Jaxon Johnstone, #21 Isaac Woodhouse, #76 Fraser Carr, #23 Joe Fawcett #7 Brocklan Parker and the #9 of Caleb Spence. The final was just getting started and looked like the epic battle everyone was waiting fore. 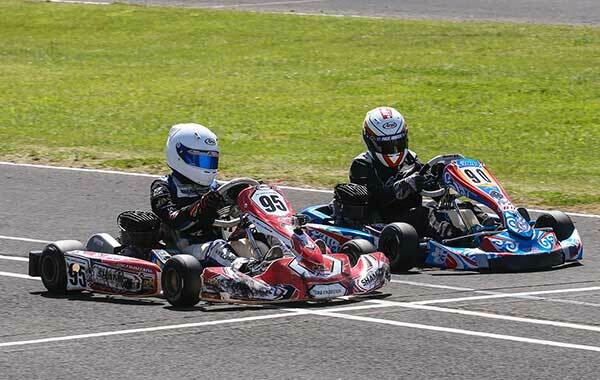 #9 Nathan Williams, #70 Aaron Oliver and #95 Daniel Hookway would put on a consummate display of close and fair racing; the two standouts being Williams and Oliver. 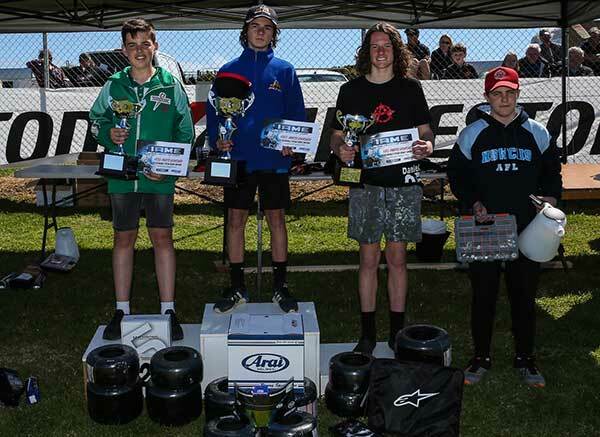 #33 Aiden Soloman, #99 Adam Jnr Slattery and #95 Daniel Hookway raced very hard throughout the heats and final for the minor places and points. 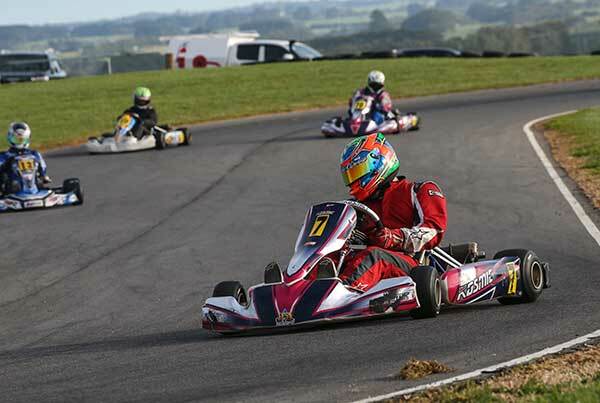 Oliver was showing impressive speed, as was Nathan Williams, leaving the rest of the field in their wake. #99 Jnr Slattery was having difficulty finding outright speed, but was doing enough to hang on to this group and claim 3rd. 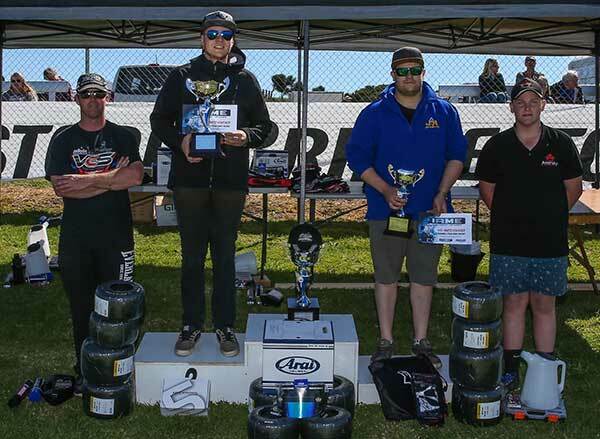 #71 Maximus Fahey was quick enough to be there and while going for 3rd position he came together with Hookway and coming off sec best dropped down the order with Hookway finishing in 5th. 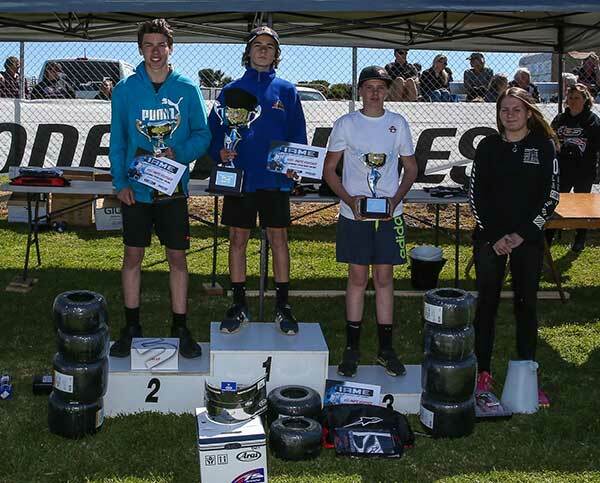 The Austrans Victorian Country Series 2017 has had it all this year with rain, cold, sun and most of all great support from competitors that were supported by some amazing sponsors totalling $57,000. It has been my pleasure and privilege to commentate the series and I just wanted to take this opportunity to say a very big THANK YOU to the VCS management team for asking me to bring all the action across the airwaves and a massive THANK YOU to all the competitors for providing me with some outstanding action to call throughout the year. I also would like to extend a big thanks to all the clubs for their hospitality and help making me feel an integral part of the 2017 VCS. Thank you to all who commented to me at the track good or bad about my effort – I really do appreciate the feedback and support. 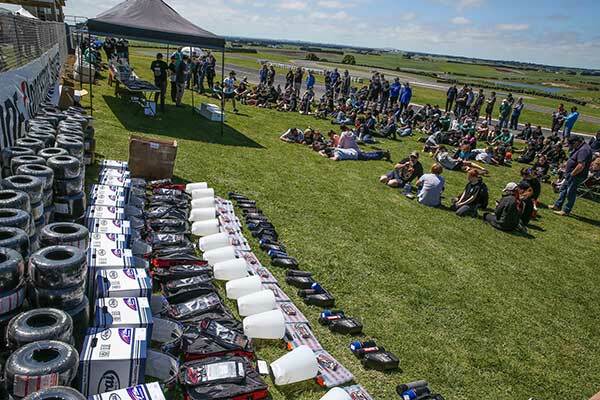 Each winner picked up a set of race gloves for their drive. Each winner picked up a $50 Kerbrider voucher for turning up.